Cashel Blue: one of the great cheeses of Ireland that is readily available in the U.S.
STEPHANIE ZONIS focuses on good foods and the people who produce them. Click here to contact her. My name is Stephanie Zonis, and welcome to Whey to Go! for March 2007. Every month, we’ll delve into a new cheese-related subject, and I’ll offer a recommendation on a cheese I love. Ardrahan. From County Cork in the south of Ireland, Ardrahan is a pasteurized cow’s milk cheese, semi-soft, with a brine-washed rind. 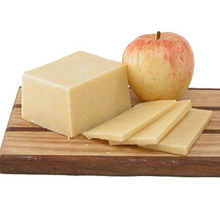 This cheese is typically described as having a nutty flavor, similar to a Swiss Appenzeller. Available at iGourmet.com. Blarney Castle. 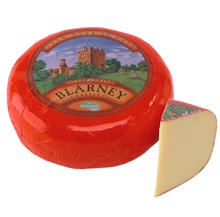 One of the better-known Irish cheeses, this is another pasteurized cow’s milk product. It’s semi-soft and part-skim, with a mild flavor, and is said to strongly resemble a young Gouda in taste. It is marketed by Kerrygold, the international trademark of the Irish Dairy Board, and sold in 80 countries worldwide. Available at Gourmet-Food.com. Boilie. Boilie is available in two varieties: cow’s milk and goat’s milk. Both types are soft cheeses, packed in glass jars with sunflower oil, garlic and herbs. A wonderful cheese for a spring picnic or an “anytime” snack. Cahill’s Farm Cheddars. These are pasteurized cow’s milk, flavored cheddars made by Marion Cahill of County Limerick, recognized as the originator of fine Irish cheese. The cheeses are visually breathtaking, each mottled like a beautiful quarried stone from flavorings that are added before the cheeses are sealed in wax to age. The Elderberry is pinkish-purple, the Porter (shown at left) is dark brown and the Irish Whisky is golden. Any of them would make a beautiful centerpiece. Available at DiBruno.com and iGourmet.com. Carrigaline Farmhouse Cheese. Another cheese made from pasteurized cow’s milk (from Friesian* herds), Carrigaline is a waxed cheese made in small wheels. It’s available both unflavored as well as with garlic and dried herbs. When young, the cheese is often compared to a Havarti, meaning that it’s mild, though it can become sharper as it matures. Find retail locations on CarrigalineCheese.com (under “Distribution”). 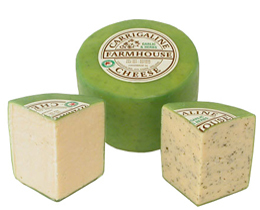 Carrigaline farmhouse cheeses, flavored (left) and with garlic and dried herbs. 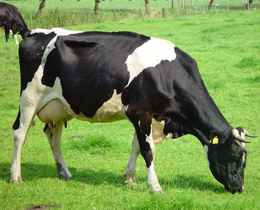 The Holstein—which today provides the classic image of a dairy cow, in various percentages of black and white. *The Holstein cow, now the most common breed of dairy cattle in the world (and 90% of the 10 million U.S. dairy cow population), produces a high volume of milk at an acceptable milk fat percentage, 3% to 4% milk fat. (The Jersey produces about half the volume of milk, but at 4 to 4.5% milk fat). The breed originated in what is now the Netherlands, in the two northern provinces of North Holland and Friesland, which lay on either side of the Zuider Zee. The original stock were the black and white animals of the Batavians and Friesians, migrant European tribes who settled in the Rhine Delta region about 2,000 years ago. Today in the U.K., the Friesian and Holstein breeds are considered separate, but they are also considered so similar that it is not possible to distinguish between them for statistical purposes. As a result, they are often called Holstein-Friesians. Crozier Blue. This is a pasteurized sheep’s milk blue, ideal for those who enjoy deep flavors. Although it is crumbly when young, as it ages the cheese’s texture becomes creamier. It’s produced in County Tipperary, in a region noted for luxuriant pastures. Available at ArtisanalCheese.com. Dubliner. Dubliner (photo at left) tastes like a mature Cheddar with the sweet aftertaste of Parmigiano-Reggiano. Created by the Irish company Kerrygold and named after Ireland’s capital city, this cheese has traits of the familiar but a profile that is completely unique. Available at iGourmet.com. Durrus. 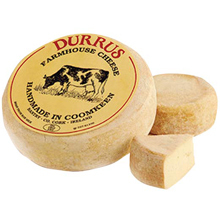 Technically called “Durrus Farmhouse Cheese,” this is a semi-soft, raw cow’s milk product. It’s a washed-rind cheese (brine is used for the washing). Although it is on the mild side when young, it becomes stronger in flavor as it matures. This cheese is ideal with fruit and possesses excellent melting qualities. Find retail locations on DurrusCheese.com (click “Where To Buy”). Mature Coolea. A Gouda-style cheese made by an American couple of Dutch descent who settled in Coolea, Ireland. Aged for more than six months, the cheese is piquant with a delicious, fresh aftertaste. The presence of wild Irish herbs in the grazing fields gives Coolea a richer, fruitier flavor than Dutch Gouda. Available at iGourmet.com. Tipperary Cheddar. If you want to celebrate with a cheddar from the Emerald Isle, the Dairygold Co-operative Society, founded in 1919, makes cheddar cheeses in Mitchelstown (Baile Mhistéala in Irish), County Tipperary. It has a rich creamy texture and a sharp taste. Available at iGourmet.com. If you don’t know where to begin, iGourmet.com sells a two-pound Irish cheese assortment (a half-pound each of Cashel Blue, Irish Green Wax Cheddar, Dubliner and Cahill’s with Guinness) for $32.99, or gift-boxed with crackers and a cheese knife for $36.99. Are you hungry yet? I know I am. While you won’t see some of these products outside of Ireland, I hope this list will encourage you to seek out lesser-known cheeses, no matter where they are made. A good-quality retailer or cheesemonger can introduce you to a whole new world of cheeses. If you are fortunate enough to find good cheese from Ireland, remember that it’s worth eating all year round, not merely on St. Patrick’s Day. Cashel Blue is a pasteurized cows’ milk, blue-veined cheese, made on the dairy farm of a husband-and-wife team of Jane and Louis Grubb in County Tipperary; much of the milk used comes from the Friesian herd on the farm. 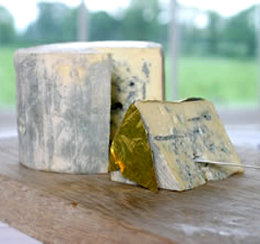 Like many other Irish cheeses, Cashel Blue uses non-animal rennet, so it’s vegetarian-friendly. Initial production of this cheese began in 1984, as a way to supplement farm income. 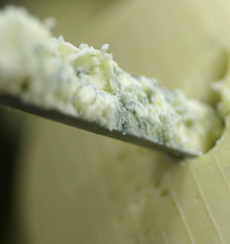 Made entirely by hand from whole non-homogenized milk, it is Ireland’s original artisanal blue cheese. It has won an award in competition every year since its inception, including the Gold at the 2006 World Cheese Awards. When Cashel Blue is young, it’s firm and very crumbly in texture. As it ages, the interior becomes softer and creamier, almost buttery. Flavor changes accompany the alteration in texture, too. As Cashel Blue ages, the piquant flavor it carries matures to a more robust, rounder taste. After about three months of aging, this cheese is known to become very potent indeed, so unless you enjoy really powerful flavors, it might be better to enjoy it when it’s somewhat younger. Where can you find it? Specialty retailers in the U.S. do carry this cheese, especially during the month of March! If you cannot find it locally, however, you can order online from Murray’s Cheese or iGourmet. on which it is made. We love it when the cheesemakers recommend wines to pair with their cheeses: Who else has eaten the cheeses day after day and has tried every possible match? Whites are the way to go. When young, the cheese has a higher acidity level: The producers recommend whites such as a Gewürtztraminer when the cheese is served with an aperitif, or a Sancerre or Pinot Grigio when used in a salad. At medium maturity, the balanced flavor and subtle saltiness of the cheese work well with late harvest Semillons such as Sauternes, or New World Botrytis Semillons. When younger, the cheese will be overpowered by a Port; but a mature Cashel Blue pairs well with vintage or tawny Ports, or with Hungarian Tokaji. For people who only drink red, look carefully for one that is not too tannic, too alcoholic or too acidic: You don’t want to overpower the subtlety of the cheese (nor do you want a flabby wine). Southern Rhone blends can work well, as do older Saint Emilions or more mature reserve Riojas from Spain. Learn more about the cheese at CashelBlue.com. Lifestyle Direct, Inc. All rights reserved. Images are the copyright of their respective owners.